distance); input—NMEA 0183 (depth alarm) up to 20 different lin- earization/calibration points; inte- grated stop watch; and program- mable time constant/dampings. Racal Survey's SkyFix service allows users to make the most effec- tive use of GPS. With an accuracy of 3-5 meters, it is suitable for many applications, including positioning for seismic exploration, rig moves and construction projects. Differen- tial correction data are generated at strategically located multiple refer- ence stations to maximize the effec- tive coverage of SkyFix. Inmarsat communications satellites as the datalinks. The enhanced range of2,000 kilometers for SkyFix is limited only by the range from the reference station over which the derived corrections remain valid and not by the range of a terrestrial datalink system. Houston, Tampa and San Francisco. Propeller for car-passenger ferry. Experimental tunnel tliruster propeller with 8 blades (5.0 m diameter, 26470 kW, 31 knots) for silent operation. Propeller for patrol vessel. High skew type for low noise and Impeller for water-jet propulsion of 75 m yacht. One type 160 minimized vibrations. (1.6 m diameter, 2030 kW, 24.5 knots) booster unit rated at 13800 kW, two type 112 units rated at 3680 kW for cruising, steering and reversing. Propeller adapted for tip fins. 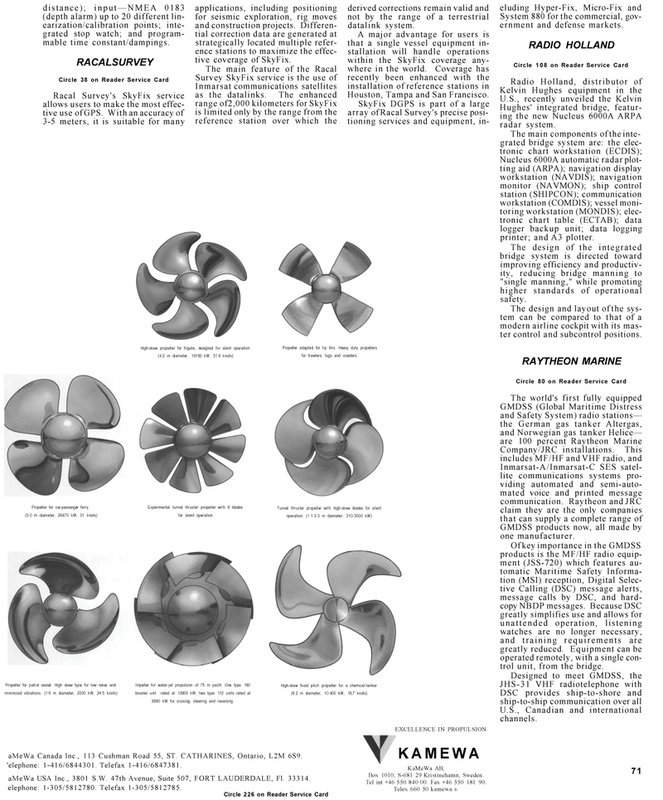 Heavy duty propellers for trawlers, tugs and coasters. High-skew fixed pitch propeller for a chemical-tanker. (6.2 m diameter, 10.400 kW, 16,7 knots) aMeWa Canada Inc., 113 Cushman Road 55, ST. CATHARINES, Ontario, L2M 6S9. 'elephone: 1-416/6844301. Telefax 1-416/6847381. aMeWa USA Inc., 3801 S.W. 47th Avenue, Suite 507, FORT LAUDERDALE, Fl. 33314. elephone: 1-305/5812780. Telefax 1-305/5812785. Box 1010, S-681 29 Kristinehamn, Sweden. Tel int +46 550 840 00. Fax +46 550 181 90. System 880 for the commercial, gov- ernment and defense markets. Hughes' integrated bridge, featur- ing the new Nucleus 6000A ARPA radar system. Nucleus 6000A automatic radar plot- ting aid (ARPA); navigation display workstation (NAVDIS); navigation monitor (NAVMON); ship control station (SHIPCON); communication workstation (COMDIS); vessel moni- toring workstation (MONDIS); elec- tronic chart table (ECTAB); data logger backup unit; data logging printer; and A3 plotter. The design of the integrated bridge system is directed toward improving efficiency and productiv- ity, reducing bridge manning to "single manning," while promoting higher standards of operational safety. The design and layout of the sys- tem can be compared to that of a modern airline cockpit with its mas- ter control and subcontrol positions. GMDSS products now, all made by one manufacturer. Of key importance in the GMDSS products is the MF/HF radio equip- ment (JSS-720) which features au- tomatic Maritime Safety Informa- tion (MSI) reception, Digital Selec- tive Calling (DSC) message alerts, message calls by DSC, and hard- copy NBDP messages. Because DSC greatly simplifies use and allows for unattended operation, listening watches are no longer necessary, and training requirements are greatly reduced. Equipment can be operated remotely, with a single con- trol unit, from the bridge.